Welcome to Day 1 of the 12 Days of Christmas! Yesterday I was so excited to finally introduce the series again and even more excited to include a fun little giveaway to start things off! In case you missed that, you can check it out here. Anyway, this year I was shopping at Lowe’s and stumbled upon these plain off-white ornaments.They immediately reminded me of the ones I loved so much but they didn’t have the fun pattern. 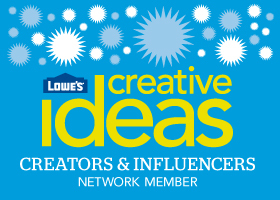 As a member of the Lowe’s Creative Blogging Team, this made me think they’d be the perfect project for December. So, I picked up two packs of eight. Each pack was under $5. I grabbed some colorful paint pens (available at any craft store) I had on hand and went to work. Although the scallops took a little practice, in no time I had some adorable handmade ornaments. As you know, one of my trees is already complete, but I have some special plans for these ornaments. I even played around with a few other patterns. I really like something as simple as tiny circles. This would be a fun project to do with kids as well. On Instagram I’ve noticed that some families set up a small tree and allow the kids to decorate it with ornaments they’ve made over the years. How fun is that? With plain ornaments and a few paints, you can have fun creating whatever designs you like. And that’s it, folks! What do you think? Do you DIY your ornaments? This post was created as part of my collaboration with the Lowe’s Creative Ideas Network (along with some other fantastic bloggers). As always, all of the opinions, thoughts, and ideas in this post are my own. Oh I love how fresh and new they look. These are so charming and so very you! These look great and remind me of something Kate Spade would pull off. Love it! My first thought was how bright and cheerful these ornaments make me feel! Love that anyone can do this, especially kids. Very cool project, Michael! Michael, I love your ideas. Thank you for your inspiration. This is so clever and simple! I love this idea. I’m definitely going to need to give it a try. Thanks for the inspiration. Adorable. I love geometric patterns, and lots of color. This year I went with a black/white/blue/silver theme but I didn’t have any black ornaments, so I spray painted some extra ball ornaments I had black, then I made white polka dots on them. Fun and cute.